Fantastic for slide and lap steel. A compressor can be a really functional component of the signal chain when playing slide or steel guitar, both for smoothing out the level for a thicker perceived sound and keeping the notes sustaining. The original SlideRIG was designed specifically for slide players and based on Lowell George's studio rig with Little Feat, which involved feeding the signal through two 1176 compressors. This pedal takes that cascaded compressor concept and offers two identical Cali76 blocks chained together for double-stage compression: plug in a guitar and you'll feel the responsive sustain. 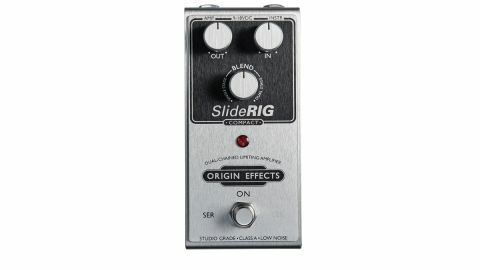 It works great for slide and lap steel with a sound that's fat and clean and rings without having to rev the overdrive. The Cali76's single-stage compression is fully anti-clockwise on the Blend knob, while in-between, you'll find cool combos of the two.